The Domboshava Community Project was founded by Highland Park, NJ resident Sylvia Hove. Despite being far from her homeland, Zimbabwe, Sylvia continues to manage the Domboshava Community Project from afar. The purpose of the Domboshava Community Project is to develop from the bottom up, the Domboshava Community through creative art, agriculture, horticulture, cultural tourism, conservation, herbal gardens and food. From Sylvia: "My mother is a Soko Murehwa and she comes from Shamu Village Govera Domboshava; My father comes from Goromonzi Chikwaka and he is a Matemai. My Grandfather moved to Hurungwe where my father grew up. I am linked to these villages through my lineage which is an important part of my culture. My passion is working with communities where I can relate in terms of land ownership, chieftainships and our totems. Culture and knowing our heritage is very important and it determines who we are as a people." This collaborative archival exhibit seeks to preserve the work of the Domboshava Comminity Project and its founder, Sylvia Hove, as well as serve as an information, resource and cultural bridge between NJ and Domboshava, Zimbabwe. 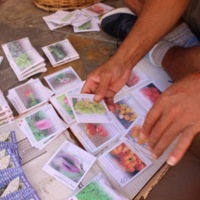 It illustrates the work being done within culture, sustainability, ecology and social entreprenuership by Sylvia, a NJ resident, eco-warrior and culture bearer. 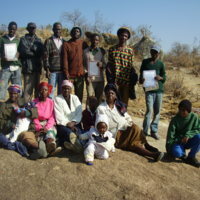 For more information about the Domboshava Community Project visit www.fishersecotourism.com. During our recent disaster relief support trip to Puerto Rico from January 12-19, 2018, Raíces Crew members were able to post some impressions on social media. This helped us to keep a kind of log of immediate reflections and experiences from the week spent with our family, friends and network of ecological and cultural collaborators throughout the island. Here is the compilation of the postings made throughout the week, along with some of the photos we took while documenting the work of grassroots organizations dedicated to sustainability, resiliency, and a just recovery for the island of Puerto Rico. Fusing art and ecology, Lisa Bagwell creates all of her sculptures out of garbage. Raíces Cultural Center hosted Lisa's EcoArt Solo Exhibit at Ruthie’s Bagel Dish in Highland Park, NJ on October 15, 2016 to kick off an eco-art initiative, bridging our cultural and ecological program components. This event has become the spark to ignite a growing eco-art movement in Central NJ. This program has been made possible in part by funds from the New Jersey State Council on the Arts/Department of State, a Partner Agency of the National Endowment for the Arts; through a grant provided by the Middlesex County Cultural and Heritage Commission/Board of Chosen Freeholders. In this exhibit of Culture Bearers in New Jersey you will find a growing collection of spotlights on talented individuals who practice and preserve the cultural traditions of the caribbean and beyond, highlighting a history and evolution of diversity in the diaspora. Whether it be dance, music or the healing arts, the evolution of these art forms continue to morph and augment in beauty and scope through their continued work and dedication. 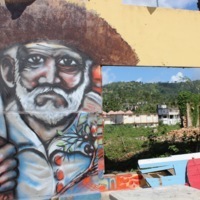 In 2009, Raíces Cultural Center's Cultural Exchange Program took its first official Exchange Trip to Puerto Rico, specifically to document, experience and bring home knowledge about the Fiestas de Santiago Apostol, held every July in the coastal town of Loíza Aldea. 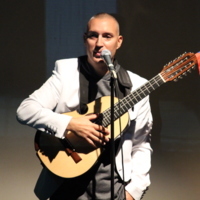 The focus of this trip was on the music, dance, song, costume, celebrations and traditions of bomba and "los vejigantes de Puerto Rico", traditions which were also presented by the Raíces Cultural Center Ensemble the same year in cultural and historical presentations in New Brunswick and Perth Amboy. The Exchange Trip allowed us to bring additional first hand knowledge and media from the Island back home to NJ to teach, share and preserve.